What are the differences between the weBoost Home 4G and HiBoost Home 4K? The weBoost Home 4G is manufactured by Wilson Electronics in St. George, Utah. Wilson is a well-known brand with over 15 years’ experience in the home cell booster market. The HiBoost Home 4K is manufactured by a Huaptec, a large, experienced company based in Shenzhen, China. Huaptec has operations in China, the United States, Europe, and India. The weBoost Home 4G is $399.99. The HiBoost Home 4K is $399.99. These systems are equally-priced and are the entry-level offerings from each manufacturer. The weBoost Home 4G has a plastic case. The HiBoost Home 4K has a metal case. Due to its plastic case, the weBoost Home 4G is much lighter than than HiBoost Home 4K. The weBoost Home 4G has two mounting holes on the back that will accept screw heads up to ¼″ diameter. Screws are not included in the kit. The HiBoost Home 4K has a metal slide on the back that is inserted into a mounting plate you attach to the wall. The mounting plate and screws are included in the kit. Both boosters receive power from external power adapters that plug into a standard 110-volt wall outlet. The weBoost Home 4G has a maximum gain of +60 dB. The HiBoost Home 4K has a maximum gain of +60 dB. Both units are rated at the same output power. The F connectors on the weBoost Home 4G are the same kind used by cable TV and satellite TV systems. 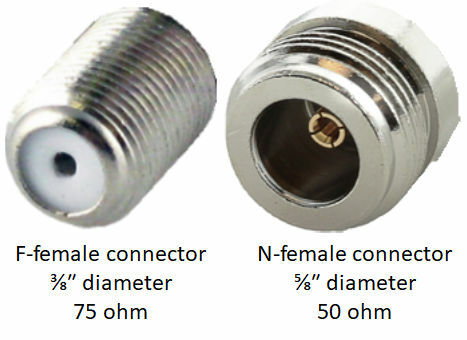 A smaller SMA connector is used with the inside desktop antenna. The N connectors on the HiBoost Home 4K are the same kind used on commercial systems; they allow the Home 4K to use a wider variety of coaxial cable types. The weBoost Home 4G kit includes two 30-foot lengths of white RG6 coax cable to connect the booster to the outside antenna. You may use just one length of cable, or connect the two lengths using the included barrel connector to create a 60-foot length. (RG11 coax, which has less signal loss than RG6, can be purchased separately and used with the Home 4G for better performance and greater coverage.) It also includes a 8-inch flat coax cable that can be run under a window to the outside antenna, if you don’t want to drill holes to run cable outside. The HiBoost Home 4K kit includes two 30-foot lengths of 200-type coax cable, one to connect the booster to the outside antenna and the other to the inside antenna. Powerful Signal also offers an upgraded Home 4K system with 400-type commercial-grade coax cable that doubles the coverage area of the system. The HiBoost Home 4K’s inside antenna is a directional panel. You can mount this antenna on a wall and broadcast signal across a room or place it flat above the ceiling and broadcast down into the room below. The HiBoost Home 4K’s outside antenna is a directional LPDA antenna. It needs to be mounted on a rooftop pole and pointed toward the cell tower with the strongest signal. 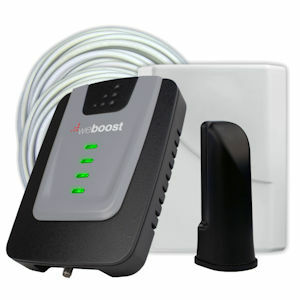 weBoost Home 4G: If your outside cell signal is weak, you shouldn’t expect the Home 4G to broadcast improved signal more than about 5 feet; if your outside signal is strong, the Home 4G will probably cover a small room or work area for a limited number of users. It also has the most options for mounting the outside antenna (window, outside wall, or rooftop pole), and its inside antenna requires no mounting at all; these features make it the better choice for renters, students, and condominium owners. HiBoost Home 4K: With weak outside signal, this unit will probably perform similarly to the weBoost Home 4G; upgrading to 400-type coax will give this unit better performance than the weBoost unit. If your outside signal is strong, you’ll likely get coverage for one or more rooms, similar to the weBoost Home 4G. The Home 4K is a more robust kit with metal case instead of plastic and a digital display instead of indicator lights; these features make it a better choice for homeowners and those who can install an antenna on the roof.